Andrea Bargnani (Italian pronunciation: [anˈdrɛːa barˈɲaːni]; born 26 October 1985) is an Italian professional basketball player who last played for Baskonia of the Liga ACB and the EuroLeague. The 7 ft 0 in (2.13 m) power forward-center played for Benetton Treviso in the Italian LBA and the EuroLeague before being selected first overall in the 2006 NBA draft by the Toronto Raptors. Bargnani began his professional basketball career in 2002–03 with Stella Azzurra Roma in the Italian Serie B2, averaging 13.2 points and 4.5 rebounds in 23 games. He then signed with LBA side Benetton Treviso for the 2003–04 season. In 2003–04, he posted averages of 4.2 points and 1.6 rebounds in 10 games for his first LBA season with Benetton. He made eight appearances in the EuroLeague, recording 2.4 points and 1.5 rebounds per outing. Incidentally, Bargnani faced his future team, the Toronto Raptors, on 20 October 2003 in a pre-season game at the Air Canada Centre. He tallied 13 points, five rebounds, one steal, and two blocks in 22 minutes in an 86–83 defeat to the Raptors. In 2004–05, he averaged 6.8 points and 3.1 rebounds in 28 LBA games for Benetton, and averaged 3.7 points and 2.1 rebounds in 12 EuroLeague matches. In the 2005–06 LBA season, he averaged 12 points, 5.6 rebounds, 1.3 blocks and 1.4 steals in 47 games for Benetton. He posted a season high of 25 points against Rome. He shot .483 from the field and .399 from three-point range, and led the LBA in blocks with 63. In the process, he helped lead Benetton to the 2006 LBA title. In the 2005–06 EuroLeague season, he contributed 10.9 points, 4.1 rebounds and 1.3 steals, while shooting .508 percent from the floor and .434 from three-point range in 18 games. He posted a season-high 20 points against Panathinaikos and Strasbourg. Bargnani was subsequently named the EuroLeague Rising Star, the award given to each EuroLeague season's best EuroLeague player aged 22 or under, for the 2005–06 season. As a prospect, Bargnani drew many comparisons to German NBA player Dirk Nowitzki, mainly due to his ability to shoot from the perimeter, his mobility despite his size, and his ball-handling skills. Bargnani entered the 2006 NBA draft and was selected first overall by the Toronto Raptors. He is the first European player, sixth non-American player, and second player without U.S. college or high school experience to be drafted first overall, after Yao Ming. Bargnani made his regular season debut against the New Jersey Nets on 1 November 2006, posting 2 points, 2 rebounds and 2 blocks in eight minutes of play. In the process, he also became the fourth ever Italian-born player to play in the NBA. Like many rookies, Bargnani took some time to adapt to the league and as he slowly improved his game, his confidence and playing time increased. In turn, the home fans soon warmed up to Bargnani; on 7 January 2007, 10,000 Bargnani figurines were given away at Air Canada Centre for the game against the Washington Wizards. As the mid-season approached, Bargnani was selected as NBA's Eastern Conference Rookie of the Month (January 2007), joining teammate Jorge Garbajosa (winner of the award in December 2006) as the sixth Raptors player to win the monthly honor. Together with Garbajosa, Bargnani was also selected to play in the T-Mobile Rookie Challenge game. After the All-Star break, Bargnani continued to work on his defence and shooting (averaging 14.3 points per game (ppg) and 3.9 rebounds per game (rpg) in 12 games in February 2007), and he was selected as the Eastern Conference Rookie of the Month for the second straight time on 1 March 2007. Bargnani became the third Raptor ever to win the award twice, joining Vince Carter and Damon Stoudamire. On 21 March 2007, Bargnani underwent emergency appendectomy surgery after being taken to hospital following illness experienced after practice the night before. He recovered after about a month, and ended the season, averaging 11.6 points and 3.9 rebounds per game. His performances were credited as helping the Raptors to their first ever Division title, as well as their first NBA Playoffs berth in five years; Bargnani came in second for NBA Rookie of the Year. In the 2007 NBA Playoffs, Bargnani averaged 11.0 ppg and 4.0 rpg as the Raptors were defeated by the New Jersey Nets 4–2 in the first round. On 8 May 2007, Bargnani and Garbajosa were named to the NBA All-Rookie team. On 5 October 2007, the Raptors announced they had exercised a third year option on Bargnani, giving a guaranteed NBA contract through the 2008–09 season and retaining a fourth year option for the 2009–10 season. Prior to the 2007–08 season, Bargnani was voted by the general managers of the league as the "international player most likely to have a breakout season". Seemingly asked to play out of position, he was slated to form the front court together with All-Star power forward Chris Bosh, but despite leading the team in scoring for the first couple of games, Bargnani struggled for most of the first half of the season. Notwithstanding his poor form, the Italian was selected to play with the Sophomores in the T-Mobile Rookie Challenge during the NBA All-Star Weekend. By the season's end, however, Bargnani was widely criticised for having a poor season. His statistics had gone down, he was not grabbing enough rebounds, was unable to shoot well, got into foul trouble easily and did not drive to the basket enough. He did not feature prominently in the playoffs either—in which the Raptors were eliminated by the Orlando Magic in the first round—and there were even calls for him to be traded. On 21 November 2008, Bargnani recorded a career-high 29 points, as well as 10 rebounds in an overtime loss against New Jersey. After some stumbles in December, he hit good form in January, averaging 21.2 points and 6.7 rebounds over a 15-game stretch as he became the starting center in place for the injured O'Neal, recording a career-high 31 points against Chicago in the process. O'Neal was then traded to Miami during the All-Star break, allowing the Italian to regain his starting spot for the rest of the season. He averaged 19.8, 17.9 and 20.3 points per game for January, February and March respectively, even as Toronto went on several losing streaks and gradually fell out of the playoff race. The Raptors concluded the regular season with 33 wins, and ranked 13th in the Eastern Conference. Meanwhile, Bargnani recorded career-high averages in points per game, field goal percentage, three-point percentage, rebounds and blocks. On 8 July 2009, he signed a contract extension with the Raptors that paid him US$50 million over five seasons, starting in 2010–11. Bargnani's form and numbers continued in the 2009–10 season. In the first ten games, the center averaged 19.3 points, 5.7 rebounds and 1.1 blocks per game; by mid-season, he had seven double doubles, a career-high. Toronto struggled at the start of the season, going as low as six games below .500, but reached the midpoint with a 21–20 record. On 2 February 2010, Bargnani scored a career-high 34 points in a loss against the Indiana Pacers; he later scored 33 in a game against the Detroit Pistons. Although Toronto were six games above .500 at one point, their form spiralled downwards after the All-Star break. Coupled with two separate injuries to Chris Bosh, Toronto slid from the fifth seed to the eighth, and were subsequently locked in a race with Chicago for the final spot. That spot was only decided on the final day, when Chicago won their last game and ended the season 41–41, one game ahead of Toronto. On Bargnani's part, he averaged career-highs in points, rebounds, blocks, and minutes. Toronto's franchise player Chris Bosh opted to leave for Miami as a free agent after his contract with the Raptors was up. As a result, Bargnani became the focal point of Toronto's offense. On 8 December 2010, he scored a career-high 41 points in a losing effort against the New York Knicks. Bargnani had a career year averaging 21 points, 5 rebounds and 1 block. 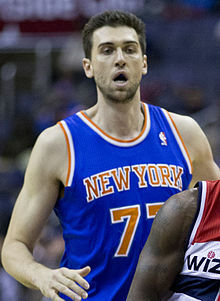 During the 2011 NBA lockout, Bargnani chose not to sign overseas and decided instead to work on his game and develop into more of a power forward following the Raptors' acquisition of Lithuanian center Jonas Valančiūnas in the 2011 NBA draft. On 28 March 2012, in a game against the Denver Nuggets, Bargnani scored 26 points and became the 4th player to ever score 6000 points as a Raptor. After managing the first 21 games of the season, Bargnani missed the next two months of action with the Raptors following an elbow injury in early December. He returned to the line-up on 6 February 2013, but after managing another 14 games, he was ruled out for the rest of the season on 13 March because of the same injury. On 10 July 2013, Bargnani was traded to the New York Knicks in exchange for Steve Novak, Marcus Camby and Quentin Richardson, along with a future first round draft pick (2016), and two future second round draft picks (2014 & 2017). On 18 December 2013, in a game at the Milwaukee Bucks, with 20 seconds remaining in overtime where the Knicks held a two-point lead, Bargnani received an offensive rebound and, instead of dribbling out the clock or getting fouled to go to the free throw line, inexplicably shot a three-pointer that missed. The game went into double overtime as a result, where the Knicks outscored the Bucks 13–7 to hold on for a 107–101 win. On 22 January 2014, in a loss to the Philadelphia 76ers, Bargnani suffered a torn ligament in his left elbow after a failed dunk attempt, and was ruled out indefinitely, eventually missing the rest of the regular season. The Knicks finished the season at 37–45 and missed the playoffs. After missing most of the preseason with a hamstring injury, Bargnani was set to make his season debut on 22 November when he was ruled out indefinitely again with a strained calf muscle. He went on to make his season debut on 31 December against the Los Angeles Clippers after having not played for nearly a year. In just under 20 minutes of action off the bench, he recorded 9 points, 4 rebounds and 2 assists in the 78-99 loss. However, the following game on 2 January, Bargnani re-injured his right calf during the first quarter of the Knicks' 81-97 loss to the Detroit Pistons. He missed a further 16 games before making his second return of the season against Miami on 9 February. On 17 July 2015, Bargnani signed with the Brooklyn Nets. He made his debut for the Nets in the team's season opener against the Chicago Bulls on 28 October, recording 17 points and 7 rebounds off the bench in a 115–100 loss. On 10 December, he scored a season-high 23 points in a 110–91 win over the Philadelphia 76ers. On 20 February 2016, he was waived by the Nets. On 26 July 2016, Bargnani returned to Europe and signed a two-year deal with Spanish club Baskonia. On 14 October 2016, in his first EuroLeague game of the season, Bargnani scored a season-best 26 points in an 85–84 win over Anadolu Efes. On 26 April 2017, Baskonia parted ways with Bargnani after a plague of injuries. In 15 EuroLeague games, he averaged 8.8 points per game, and in 14 ACB games, he averaged 11.5 points per game. Bargnani played for the Italian junior and under-20 national teams. He competed on the World Select Team at the 2004 Nike Hoop Summit. He also featured in EuroBasket 2007, representing the Italian senior national team. Italy finished ninth in the competition, and in six games, Bargnani averaged 12.7 points, 5.0 rebounds, and 28.7 minutes per game. He was called up to the Italian squad that took part in EuroBasket 2015. Bargnani averaged 14.8 points and 3.6 rebounds per game, while Italy finished the tournament in sixth place. ^ a b c d e "Andrea Bargnani Info Page – Career Stats and Totals". NBA.com. Archived from the original on 28 January 2015. Retrieved 20 February 2016. ^ a b c d "Andrea Bargnani Info Page – Bio". NBA.com. Archived from the original on 14 January 2013. Retrieved 20 February 2016. ^ a b c d e "Bargnani Serie A & Euroleague stats". DraftExpress.com. Retrieved 23 February 2013. ^ Broussard, Chris (28 February 2007). "ESPN The Magazine: Meet Andrea Bargnani". ESPN. Retrieved 28 February 2007. ^ Pelton, Kevin (11 March 2007). "Insider Preview – Sonics at Toronto". NBA.com. Archived from the original on 20 February 2009. Retrieved 11 March 2007. ^ Schuhmann, Jon (28 June 2006). "The Long Journey for No. 1". NBA.com. Retrieved 28 June 2006. ^ "Raptors at Nets Box Score". NBA.com. 1 November 2006. Retrieved 1 November 2006. ^ Robbins, Liz (28 June 2006). "Going Where No Italian Has Gone". NYTimes.com. Retrieved 28 June 2006. ^ "Raptors Post-Up". NBA.com. 7 January 2007. Archived from the original on 3 January 2009. Retrieved 7 January 2007. ^ a b "Bargnani Named Eastern Conference Rookie of the Month". NBA.com. 1 February 2007. Archived from the original on 1 December 2008. Retrieved 1 February 2007. ^ "No. 1 Draft Picks Bargnani and Bogut Head Selections For 2007 T-Mobile Rookie Challenge & Youth Jam". NBA.com. 31 January 2007. Retrieved 31 January 2007. ^ a b "Bargnani Named NBA Eastern Conference Rookie of the Month". NBA.com. 1 March 2007. Archived from the original on 16 January 2009. Retrieved 1 March 2007. ^ "Raptors' Bargnani has appendix removed". ESPN. 22 May 2007. Retrieved 22 May 2007. ^ "Roy receives 127 of 128 first-place votes as top rookie". ESPN. 3 May 2007. Retrieved 3 May 2007. ^ "Andrea Bargnani & Jorge Garbajosa Highlight 2007 All-Rookie Team". NBA.com. 8 May 2007. Archived from the original on 15 January 2009. Retrieved 11 May 2007. ^ "Raptors Exercise Third Year Option On Andrea Bargnani". NBA.com. 5 October 2007. Archived from the original on 15 January 2009. Retrieved 5 October 2007. ^ Grange, Michael (25 October 2007). "GMs tip Bargnani for big year". TheStar.com. Retrieved 26 October 2007. ^ Grange, Michael (15 November 2007). "Defence gets the point, but offence doesn't". TheStar.com. Archived from the original on 16 January 2009. Retrieved 30 November 2007. ^ "Bargnani & Moon Selected To Play In '08 T-Mobile Rookie Challenge". NBA.com. 30 January 2008. Archived from the original on 1 December 2008. Retrieved 30 January 2008. ^ a b Feschuk, Dave (30 April 2008). "Raptors' Bargnani a symbol of stalled progress". TheStar.com. Retrieved 30 April 2008. ^ a b Smith, Doug (16 November 2008). "Bargnani could shift to Raptors' starting unit". TheStar.com. Retrieved 16 November 2008. ^ "Big Night From Bosh, Bargnani, Calderon Not Enough". NBA.com. 21 November 2008. Archived from the original on 2 March 2009. Retrieved 22 November 2008. ^ Grange, Michael (16 January 2009). "O'Neal indifferent to trade talk". TheGlobeAndMail.com. Retrieved 16 January 2009. ^ "Rose's 4th-quarter run, Deng's return to starting lineup carry Bulls". ESPN. 14 January 2009. Retrieved 14 January 2009. ^ Aldridge, David (13 February 2009). "Raptors trade O'Neal, Moon to Heat for Marion, Banks". NBA.com. Archived from the original on 15 February 2009. Retrieved 13 February 2009. ^ a b "Andrea Bargnani Game Log". ESPN. Retrieved 16 March 2009. ^ "2008-09 NBA Season Summary". Basketball-Reference.com. Retrieved 16 April 2009. ^ "Report: Raptors sign Bargnani for 5 years". TheStar.com. 8 July 2009. Retrieved 8 July 2009. ^ "Raymond Felton hits tiebreaking 3 as Knicks beat Raptors". ESPN. 9 December 2010. Retrieved 9 December 2010. ^ Charitopoulos, Konstantinos (26 August 2011). "Why NBA Lockout Doesn't Harm Andrea Bargnani, at Least Now". BleacherReport.com. Retrieved 26 August 2011. ^ "Bargnani reaches 6,000 points as Raptors defeat Nuggets". TheChronicleHerald.com. 29 March 2012. Retrieved 29 March 2012. ^ Steinberg, Russell (12 December 2012). "Andrea Bargnani injury: Raptors big man has torn ligaments in elbow". SBNation.com. Retrieved 12 December 2012. ^ "Andrea Bargnani Injury Update". Raptors.com. 13 March 2013. Archived from the original on 11 October 2014. Retrieved 13 March 2013. ^ "Raptors Acquire Three Players, Three Picks From Knicks". NBA.com. 10 July 2013. Archived from the original on 6 October 2014. Retrieved 10 July 2013. ^ Highkin, Sean (23 November 2014). "Andrea Bargnani out indefinitely after suffering calf strain". NBCSports.com. Retrieved 23 November 2014. ^ Berman, Marc (1 January 2015). "How Andrea Bargnani fared in much-delayed season debut". NYPost.com. Retrieved 1 January 2015. ^ Baumbach, Jim (2 January 2015). "Knicks lose Andrea Bargnani again, then lose to Pistons, with Anthony ailing again". Newsday.com. Retrieved 2 January 2015. ^ "Heat rally to top Knicks 109-95, with Anthony ailing again". NBA.com. 9 February 2015. Retrieved 9 February 2015. ^ "BROOKLYN NETS SIGN ANDREA BARGNANI". NBA.com. 17 July 2015. Retrieved 17 July 2015. ^ "Bulls beat Nets 115-100 for 2-0 start". NBA.com. 28 October 2015. Retrieved 28 October 2015. ^ "Bargnani scores season-best 23, Nets beat 76ers 100-91". NBA.com. 10 December 2015. Retrieved 10 December 2015. ^ "Brooklyn Nets Waive Andrea Bargnani". NBA.com. 20 February 2016. Retrieved 20 February 2016. ^ "Andrea Bargnani 2006 NBA Draft first pick is Laboral Kutxa Baskonia new player". baskonia.com. 26 July 2016. Retrieved 27 July 2016. ^ "Baskonia Vitoria Gasteiz vs Anadolu Efes Istanbul". EuroLeague. 14 October 2016. Retrieved 6 October 2018. ^ "Andrea Bargnani, Baskonia officially part ways". 26 April 2017. Retrieved 26 April 2017. ^ "Andrea Bargnani (Italy)". Eurobasket2007.org. Archived from the original on 16 July 2010. Retrieved 30 September 2007. ^ "Italy take their dream roster to Berlin". FIBAEurope.com. 2 September 2015. Retrieved 2 September 2015. Wikimedia Commons has media related to Andrea Bargnani.